I’m looking forward to next year’s Portal 2 by Valve, in no small part because of the co-op mode where you team up with another little robot buddy and make your way through test chambers. Mistakes are sure to be made, though, and you may end up flinging or dropping your comrade to his/her death. Or maybe crushing. Or burning. Burning is always a possibility. Burning is really unavoidable when you get right down to it. Cold, mechanical apologies. They work. This got me thinking about some research I’ve read on the power of the apology and how it really is missing in a lot of games. In his book, The Upside of Irrationality, Dan Ariely describes a simple and interesting field experiment he and a colleague conducted to see what effect an apology would have on remedying a minor annoyance. They hired an actor to sit in a coffee shop and ask patrons to complete a short exercise in exchange for $5. I don’t even know what the exercise was –something about circling letters– but that’s not the point; the exercise was just there to take up 5 minutes of time. At the end of that time, the actor would come over and then pretend to overpay participants by “accidentally” mixing in a $5 bill with the singles he was supposed to give them. This was, of course, done so that the researchers could see how people reacted to being overpaid. Why? In a 1997 study3 Michael McCullough, Everett Worthington, and Kenneth Rachal found that a good apology forged forgiveness through the act of empathy –that is, understanding of emotions between the offended and the offender. 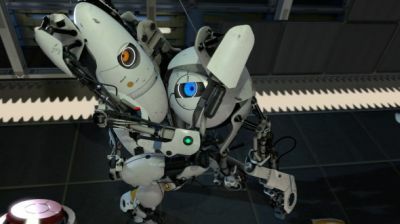 Ironically, this is one reason why I think the little robot hugs in Portal 2 work so well: those little guys look like they’ll have a lot of personality and exhibit more emotion than avatars in most other games. Of course, apologizing is possible wherever there’s voice or text chat, but it’s probably not used as often as it should be, and in a fast-paced multiplayer game with lots of things going on, it’s kind of hard sometimes to apologize or even be heard if you do. But with a slowly paced game like Portal 2 or Little Big Planet, there’s not only every chance to apologize for a goof up, but there’s a lot more riding on it in terms of how well the other person cooperates, communicates potential puzzle solutions, or even if he/she drops out of the game altogether. Fortunately, even simple –or even insincere– apologies are particularly potent. And this is why I believe that hugging robots should be in every children’s Social Studies textbook. Make it happen, Congresspeople. 1. But didn’t, unfortunately, offer up any hugs. 2. Though that obviously means 55% of people kept it, even when they were instructed to count it and sign a receipt saying they had only received $5 and not $9. 3. McCullough, M., Worthington, E., & Rachal, K. (1997). Interpersonal Forgiving in Close Relationships. Journal of Personality and Social Psychology, 73(2) 321-336. Also, I promise not to go back to the Ariely well again for a while. I just needed something quick this week. Interesting stuff on motion controls coming next week! Can’t wait for the psychology of motion controls. I bet it occurs mainly in the board of directors and involves lusting after more staggeringly large piles of cash.